WHAT’S A HEALTHY BEAUTY LESSON? My guess is that like most other women, you’ve never been taught the right way to do your makeup or take care of your skin. It can be seriously overwhelming to find cosmetics that are good for you, natural, organic, and actually work. And if you’re over “a certain age”, you’ve probably noticed that your same-old skin care and makeup routine (or lack thereof) is now making you look older than necessary. Wouldn’t you feel much more confident if you had a true professional evaluate your needs, and give you the right tools to look your very best for where you’re at now? When you sign up for a Healthy Beauty Lesson with me (a makeup artist for over 20 years) or with one of my highly-experienced skin care professionals, you’ll learn proper techniques tailored to support your beauty inside and out. In every Healthy Beauty Lesson you’ll get product suggestions hand-picked for you from the best, tried-and-true natural brands. You won’t be pressured to buy anything because, unlike sales people or the “self-proclaimed internet experts”, our goal isn’t to push products. It’s to educate and make recommendations based on your needs. Meaning, no more buying stuff that isn’t good for you, doesn’t look that great, and ends up partially used, taking up space in your cabinets! Imagine what a relief it will be to clear through the clutter, and ditch unhealthy, disappointing cosmetics for good. You don’t have to be in New York, Los Angeles, Milan or Paris — or spend thousands to get there to access my team of real beauty pros, because you can simply book a virtual lesson! Whether you go for a Healthy Makeup or Healthy Skin Care Lesson (or both!) it’s an investment in yourself that you’ll benefit from for years to come! Makeup seems to be a mystery for so many because we’ve never been taught how to put makeup on the right way. Much of what we’ve learned is through trial and error with random advice and products over the years. Then once gravity and age set in, things really get tricky. Sought after for my “Age-Defying Makeup Techniques,” I have helped hundreds of women look fresh, revitalized, and years younger without surgery or Botox. Whether you’ve got 5 or 45 minutes to get ready, whatever age you are, I can teach you (in-person or online) how to use makeup to showcase your best features and look polished. We’ll focus on what is most important to you to maximize your best assets, so you can you take on the world feeling vibrant and beautiful — using the best natural, organic cosmetics, of course! Are you ready to transform yourself, learn to use makeup to your advantage, and get on your way to a lifetime of healthy beauty? No matter where you are in the world, you can benefit from Kristen’s expertise to give your look new life, at a time that works for you! All you need is an internet connection and a device with a webcam. One-on-one access to the years of Kristen’s research and knowledge, so you can forgo the time and expense of trial and error decision making. Application techniques specific to your face to really maximize your best features. A detailed list of healthy product and color suggestions based on the look you want to achieve and your lifestyle. Update your look with an in-depth, in-person package that includes a Healthy Makeup Lesson + a virtual Brush Up Session. This in-person portion of this makeup lesson will be held in Portland, OR. Other cities such as New York, Los Angeles, Milan, etc. are based on Kristen’s travel plans announced in the weekly newsletter. To request your city be considered, use the contact form. A before and after photo from the session emailed to you – a wonderful reference to have and fun to see the transformation. A follow up virtual Brush Up Session to reinforce everything you learned, and answer additional questions. I feel much more confident in my application with each day. Your instruction and help in choosing my foundation, bronzer, lip color, etc. was crucial. My friends noticed right away and said I was glowing. Who knew a little makeup could lift my spirits so! I truly felt wonderful – rejuvenated, fresh, and NOT like anyone else, but (the real) me. 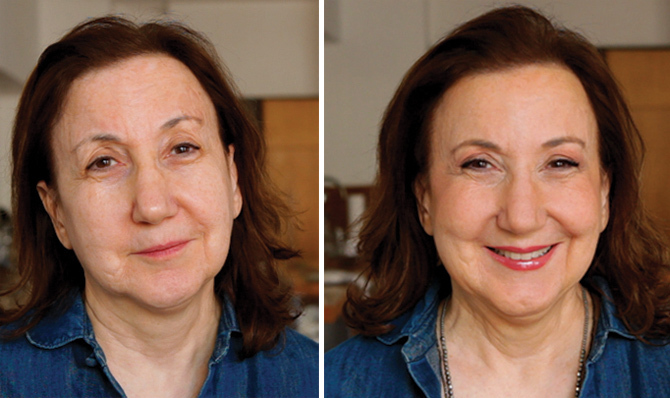 I learned that the right makeup (and layering) will give you that boost and take away that tired look – and feeling. I had a private consultation and makeover with Kristen who instructed me on the best way to use cosmetics for my age, seems we have special challenges over 50! She also showed me how to highlight certain features and how to correctly apply to get the desired finish. Kristen used some of my existing makeup, but she also introduced me to some other green brands. I loved the look that she gave me, we got to play with fun colors that really worked for me. Kristen has such a wealth of knowledge and she did a great job! Totally worth it! I thought I knew a lot about makeup application, but Kristen has so much experience that she gave me some amazing tips that I still use years later! Aside from that, she's wise, compassionate, and funny. The session flew by and I walked away knowing exactly what to do and what to stop doing. Highly recommended! Opera season started last week, the first time I have been to the Met since my make-up consultation with you. The first comment I received from the usher in my usual section was that I looked absolutely fabulous this year and she specifically mentioned my make-up! She thought it made a huge impact. So much so that she asked me for your contact information. Thank you! When your body is healthy and your skin is happy, your face will radiate beauty. You won’t need to cover anything up – you’ll want to show it off! The Healthy Skin Care Lesson is an online, private appointment to address your most pressing concerns with a top, licensed skin professional. We’ve broken it down into 6 parts so you receive maximum benefit from your highly-concentrated time. You’ll be set up with a powerfully, effective skin care regime customized to your needs. Your session starts with a skin analysis based on your answers to our “skin and lifestyle inquiry”. This inquiry will be emailed to you, to be completed and submitted 24 hrs prior to appointment time, so our skin pro may review it in preparation for your session and to maximize your time together and establish your goals for the session. You will spend about 30 minutes on a Skype or phone call (video chat is preferred) speaking one-on-one with our pro so you can feel confident that she/he has really understood your needs and you can ask questions instantaneously to hone in on the specific information you most need to know. During the call our skin pro will thoroughly review your current skincare routine to establish where you are at and weed out any products that may be unnecessary or potentially damaging to your skin. You will get customized recommendations on which natural, safe and healthy products to use for your individual skin, and HOW to use them. Many people don’t use the proper techniques for washing, exfoliating and hydrating their face, ultimately un-doing all the good the product might be able to provide them with. If no changes in products are necessary, she/he will also tell you that so you don’t waste money buying things you don’t need. You will receive holistic lifestyle, diet and supplement suggestions, pertaining to your skin goals. Finally, after the call you’ll receive an email follow up, with a break down of your session so you have the crucial information on hand to reference at any point you chose following the call.